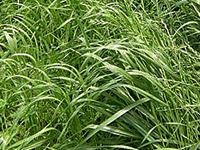 Annual Ryegrass (lolium multiflorum lam.) is high in fiber and low in protein. Farmers will use ryegrass as a mix with low fiber, high protein alfalfa creating a nutritious, economical animal feed which aids in preventing digestive disorders. Also, may be referred to as Italian Ryegrass. Annual ryegrass is recognized as one of the highest quality cool-season grasses. In its leafy stage, it can be high in protein, digestibility, vitamins and minerals. Single-Compressed (50-60 kg) raw material from the field. Double-Compressed bales processed from raw material. For use with Full Bale and Half-cut packaging. Pacific Northwest (PNW): One harvest per year. Begins in early July and continues through the month (dependent on weather conditions). Average yields for annual ryegrass are 2-3 tons/acre. However, this can vary based on variety, grower practices, and growing conditions.